Wow, half way through the year already, doesn’t time fly! June promises to action packed with events and new arrivals galore! Coming up on the 5th June is ‘World Environment Day’, where we’ll be joined by a local beekeeper for the GRAND OPENING of our renovated Beehive. Then, later in the month, it’s Father’s Day, where all dads will receive a free hot drink and cake. We also hold our famous Fathers Day Steeplechase, where dads race each other over our sheep race course to win a free family ticket – and their child’s praise! We will also be formally welcoming Rey our Palawan Binturong into experiences, with our Asiatic Experience due to start in late June. Name Your Favourite Animal. Drop us an email telling us your favourite animals, and why. If it’s chosen, we will include it as next months ‘Animal of the Month’, and each winner will receive a ticket to visit us in July. This month we welcome a brand new animal in our Brush Tailed Possum – this little cutie is only found in Australia and has been names Leena – Aborigine for Possum. We’ve also finished our Caiman enclosure and welcomed 2 new Caiman called Samson and Delilah. This month sees our Father’s Day and World Environment Day events as well as our weekly Mums and Tots group. Allison is our Senior Keeper here at Hoo Farm. She started as a volunteer back in 2012, quickly becoming an integral part of the team and is now Becky’s right-hand lady. 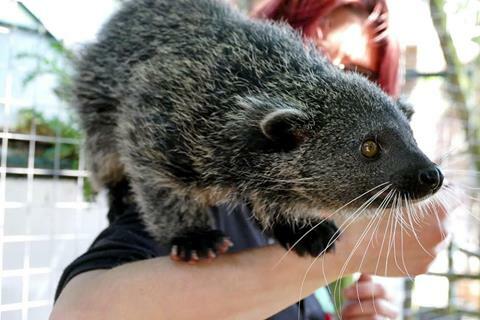 She can often be found cleaning or feeding the animals, or leading one our popular encounters..
Our Palawan Binturong Rey is one of the very few on public display in the UK. This critically endangered species is only found on the island of Palawan in Indonesia and is renowned for it’s popcorn-like smell.